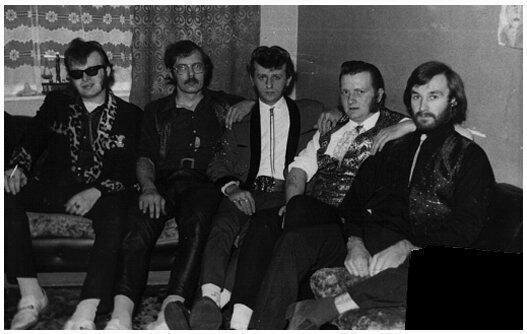 The story of the fantastic 1970's Teddy Boy Band, the Riot Rockers from Cleethorpes, Lincolnshire. The majority of this text is credited to 'The Riot Rockers' former web site. If you could imagine a seaside coffee bar in the town of Cleethorpes, Lincolnshire in 1964. That is where two of the founder's of the Riot Rockers (Ray Firth, Johnny Fox) were sat and enjoying the entertainment of the juke box with it's flashing light's and loud music and also the smell of hot espresso. They were two disc jockeys in there early twenty's and they both had a love for fifties music. Who would have guessed that in a few years time along with two other music lovers they themselves would be playing around Britain and Europe and making records for other people to listen to. Riot Rockers Publicity Shot, Kent Street, Grimsby 1975.
sby, 1975.Later on in the sixties the third member John Scargall met up with Ray and Johnny. John had a good feel for rhythm guitar and also had an understanding Mother and Father who allowed them to practice in their front room. They would practise every Saturday afternoon's and would play every Rock 'n' Roll number they knew. The music seamed to sound better when they were jumping on and off the furniture, even though some of the cords were the wrong one's but that didn't matter. For a while the group remained with just the three of them. 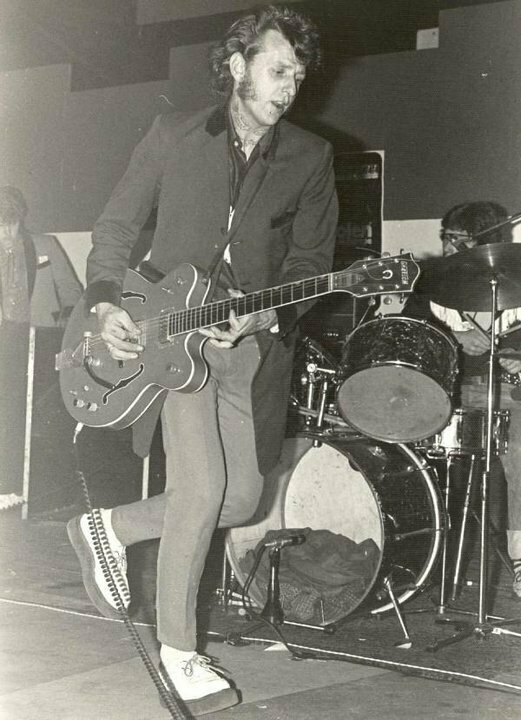 Ray and John played rhythm guitar and Johnny sang the vocals and at the same time he did the drumming with a two piece drum kit, a snare drum and hi-hat. 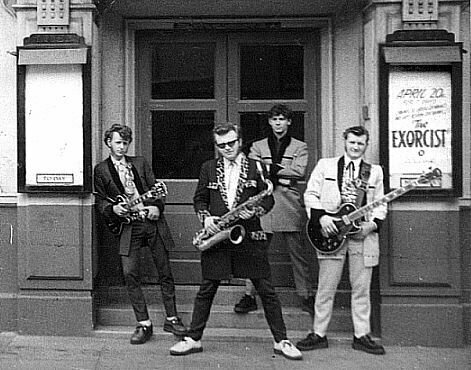 Riot Rockers outside the Tower Cinema, Grimsby 1973. One Saturday afternoon John decided they should have a P.A. system and that he had sorted one out. They all entered the room and there, sat on the table was an old 1950's radio set and from it was a spaghetti of assorted wires leading up to the picture rail. Fastened to the rail there was over a dozen assorted loudspeakers in a cabinet which he had taken from old radios and record players and were held up by drawing pins in a long chain of twisted joints that encircled the room. It looked like a scene from some mad professor's laboratory. The group struck up and after three or four electric shocks the loudspeakers progressively started to rattle and fall to pieces whilst one of the larger ones quietly emitted smoke which blackened a section of the ceiling above it. Before the group thought they were ready to do there first live performance it was 1971. Another player was added to the group Alf Ludlam, he played the piano. Alf was eager to do a live gig. 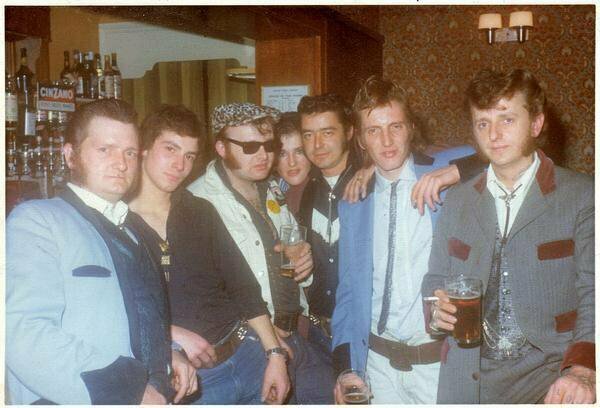 So in February 1971 the group played at the Queens Hotel in Cleethorpes. 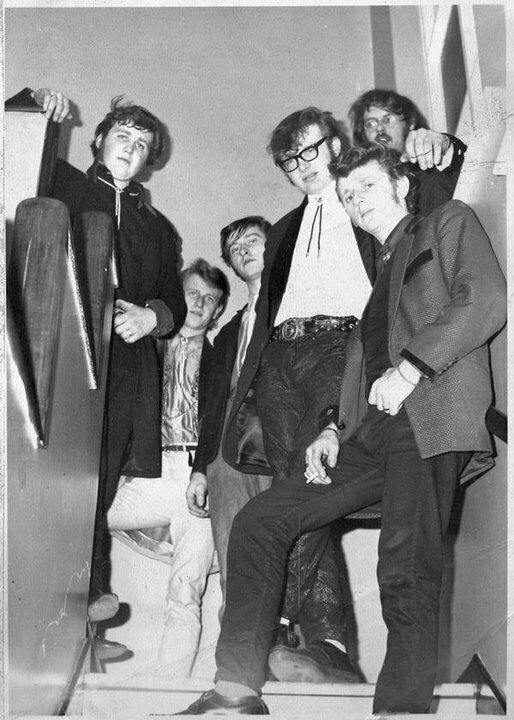 At the Queens Cleethorpes 1971- just formed the group Johnny and The Blue Cats with John Maddison Lennie Hopkin Alf Ludlam, Johny Fox and Ray Firth. 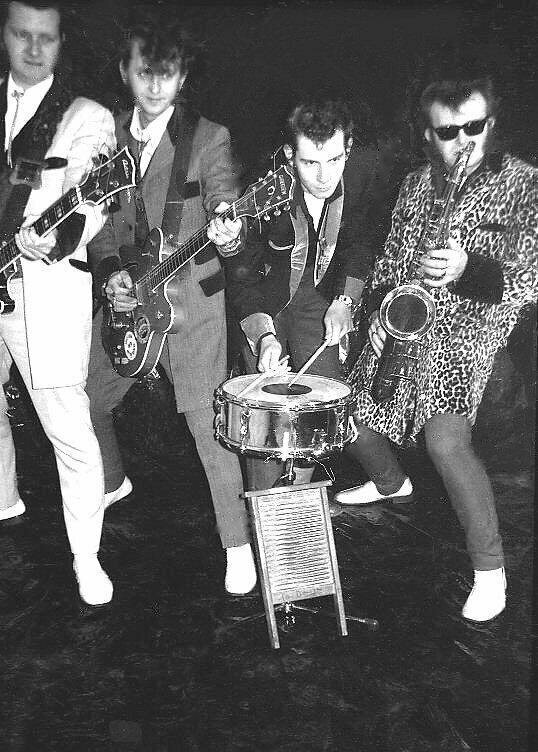 For some time the group called themselves Johnny and the Blue Cats and they went on to perform over two hundred gigs. The Blue Cats finally disbanded in 1972 after a lot of changes to the line up. A fresh line up was made in 1973 consisting of Ray Firth on lead guitar, Johnny Fox on vocals, Alf Ludlum on piano, John Scargall now on bass and a new face Roger Parrot on drums. This was the beginning for the Riot Rockers. Soon after Alf and Roger moved on. The other three now needed a drummer. They found one (Paul Whittingham) a bright young lad eager to have a go. At the time he was playing in a group doing pop music the kind of music the other three hated. He could also be manipulated by the three originals. Now with a full line up the group were having great success, they did a three week stint at the Hard Rock Cafe in Copenhagen, record deals came next, tours of Europe and London was a bi-weekly excursion. The group met Little Tina of Flight 56 and the two groups toured together in Holland in 1979. Then came another knock back Paul was trying to keep down a regular job and he found the touring schedule was too demanding. So he left later in the year. They were now a drummer short, so Johnny played drums and sang. 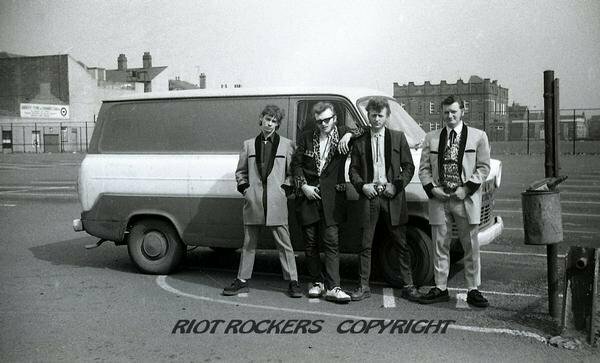 Between the years of 1975-1988 the Riot Rockers were well documented. In 1988 the group went through dramatic changes up until a dormant period which lasted from 1989-1993.In January 1989 the band had bad news John Scargall had suddenly lost his life to cancer. He was replaced with Jack Cheeseman) on slap bass. Ray and Johnny did there own thing with various other groups in 1994.They joined forces to revive the Riot Rockers, they still had no drummer but was able to get a stand- in for the early gigs. A telephone call in May 1994 secured them with a drummer, his name was (John Coulson) he had also played with the band in 1986. In September 1994 Jack Cheeseman announced he wanted to do other things so he was replaced with(Paul"gregs"Gregory) a student who had learned the rudiments of the slap bass. The group were still trying strong and in 1995 an album was recorded which had been long overdue for all the knock backs they had and resolved. Ray Firth in Holland, 1976. "The Riot Rockers played a gig in Marbella, Spain in 2005 and we had a lot of problems with the stand-in guitarist which was the start of the break up. That wasn't Ray by the way. Anyway, I told the guy I wouldn't play with him in the band anymore, so we drew a line under it as all the enjoyment had gone out of it. Since then we have got together and done about six or so gigs with Ray Firth on guitar but he is struggling now as his left hand has a guider problem and his third finger and little finger are permanently bent over, not good for a guitarist. So six gigs in six years a bit of a come down from six nights a week ! As of 30th October 2013 just gone, we lost our bass player Andy Clough as he has emigrated to Australia, so I cant see anything happening again soon. There aren't any musicians round here to get something going, so am DJ ing quite a bit instead. I still see Ray quite often and he says he's going to get his hand fixed so I guess if he does..... well you never know ??? Never say never eh ? Best regards Johnny"
Johnny Fox at the Doncaster Top Rank Rock n Roll Dance 1980s.